Radiation from the sun can produce energy to heat and cool our homes, buildings and cities. Solar energy can be collected in an ‘active’ way by placing solar panels on the roof or walls of a structure. Solar panels absorb the sun’s rays, which are then used to power parts of the building. The sun can be used to heat and cool a house in a ‘passive’ way through thermal conductivity. In addition to thermal mass, the sun’s rays can be used to light a space during the day, minimizing the need for lights and reducing the electricity used by the building. The earth stores an enormous amount of heat below its surface. 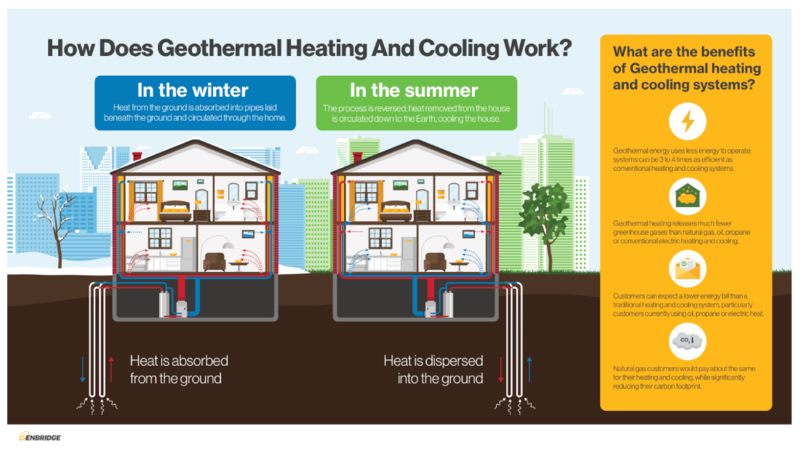 This natural heat can be used to heat buildings by pumping water pipes through the earth in order to accumulate heat, and continue the flow through the building in order to emit the heat out into the spaces. Wind turbines convert kinetic energy harnessed from wind into electrical power. Wind is a renewable, clean and sustainable energy resource. RNG is clean and Carbon-neutral fuel that is created from decomposing organic waste- like green bin collection waste (vegetable peelings), cow and farm waste, and landfill gas. Either falling water or fast-flowing water rotates turbines (a series of buckets, paddles or blades arrayed about the circumference of a wheel or cylinder), which drive generators, converting the turbines’ mechanical energy into electricity. Hydroelectric power is continually renewable and produces no pollution. Although water is a renewable resource, hydroelectric projects often lead to a disruption in habitats for fish and wildlife.